“When I decided to leave Iran, I tried to move to England because I was so sure that Germany wasn’t the best choice for me,” remembered refugee David*. “I don’t know Germany. I don’t know the language. “That church” was Trinity Lutheran Church, where Rev. Hugo Gevers has baptized more new believers in the past year than he has in the previous nine years combined. Almost all of those baptized have been Iranians and Afghans seeking political asylum. Lutheran pastors wanting to share the Good News now have a new way to communicate with Iranian immigrants throughout Germany, Europe and the rest of the world: Luther’s Small Catechism with Explanation, translated and published by the Lutheran Heritage Foundation in the Farsi language. In November, LHF executive director Rev. Matthew Heise spent a week helping distribute the Farsi catechism to Lutheran churches ministering to thousands of Iranians in cities like Berlin, Hamburg and Leipzig. As new believers delve deeper into their Biblical studies, the differences between Islam and Christianity become even more apparent. Rev. 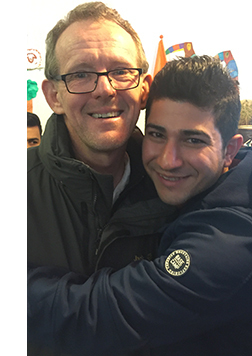 Gevers’ caring approach has made a world of difference to refugees like David. “I have been baptized in this church,” David proudly shared. “I love my pastor; he is like a real father. He is so good and so kind. “When people ask me how I am, sometimes I am quiet,” he continued. “I can’t tell them everything of how I am feeling, because it is so hard. But I know Jesus.